The Yorkshire Post topped the ABC league tables for the lowest circulation decline over the second half of 2016 as all UK regional dailies posted falls in average sales. Average daily circulation for print and digital editions at the Leeds-based title fell 3.6pc in the period July to December 2016 to stand at 25,178. Also performing relatively strongly were the Irish News, down 3.9pc, and the South Wales Argus, which showed a drop of 5.8pc. But the YP’s Johnston Press stablemate the Yorkshire Evening Post saw sales fall by 19.2pc, while pro-Scottish independence daily The National – last year’s sales success story – posted a 30pc drop. The Express & Star, Wolverhampton, remains the UK’s biggest selling regional daily title with an average daily sale of 55,373, ahead of Aberdeen’s Press & Journal with 51,880. Circulation figures for all UK regional dailies, in order of the change year-on-year, are as follows. Scroll down for a version of the table showing the titles in order of actual circulation. Another huge 10% sales loss for the EDP on the back of a rapid steady and ongoing decline,and with the dreadful reader written evening news now selling little over 9,000 copies we are all wondering just how long they will allow these two once credible titles to continue in print form, our guess here is they’ll both move to online editions only by year end at latest and in the case of the NEN odds on it’ll be closed ahead of then, unless of course they have money to burn by keep throwing money at them propping them up while the rest of the company counts paoerclips. Just how far can these papers fall before action is taken? 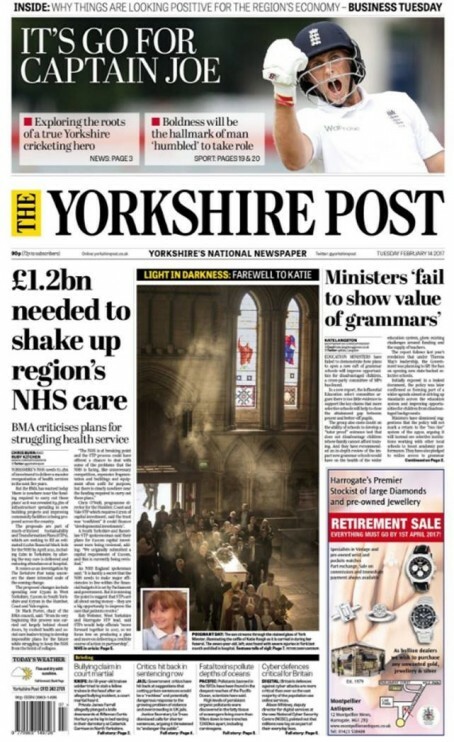 Interesting to note that the Yorkshire Post is one of the few regionals to maintain a team of staff photographers. Perhaps this is part of the reason why that newspaper is performing “relatively strongly”? Erm, there’s a rabbit off somewhere. It’s interesting to note how few comments these latest shocking ABC sales figures attract these days when not so long ago losses this bad would have been big news attracting many views,comments and opinions from those passionate about their own local titles to tale the time to post. could it be we accept there’s no way back from the implosion that’s been happening in the regional press ? Could it be that we are no longer surprised to see once mighty titles in complete free fall and just accept this is their fate? If so it makes you wonder what long term future if any, many of these papers have? with no sign of any reversal of sales trends and no investment in these papers are we just treading water and accepting they’ll continue to decline to such an extent that decisions will need to be taken as to whether they are allowed to continue or if the plug is finally pulled to save costs. This must surely be the end of traditional local regional papers as we know them as they’ve fallen so far down there’s clearly no way back up. Some of these once admirable papers are showing a drop of 90 per cent from their peak sales (albeit some time ago). How can papers in large town-cities like Brighton (11,000 a day) and Nottingham (17,000) sell so few papers. Some papers like this were selling more than 100,000 a day at their peak. Still, the web will save us all. I’m sorry but why is this a surprise … the managements see the print making things as a distraction. I’m told they barely have meetings any more in some cases, just thrown together by subs while everyone stands round screens looking at clicks. 1 If digital is so great, why is anyone still doing print? 2 With all the digital figures touted around, who is investigating the ‘quality’ … my regional paper seems to be simply bait for morons who call for people to be hanged or who remark that such and such school was s***. Digital marketers see ad blocking as a ‘grave threat’. The whole thing is crazy … print, done correctly, delivered effectively and priced sensibly (or free) still works really well. Digital is just a mess and it makes peanuts … certainly not enough t sustain a big city office with lots of staff. Norridge, It is more like the end of those regional papers taken over by large corporates, who have ransacked them and their communities for every last penny. They are anything but the traditional regional press. Look hard enough and you will see there are still some independent papers who offer quality news and a quality readership. You’re correct about some of the smaller independent publishers returning good figures Fleetwood and they very much are the way ahead for what’s left of regional daily or eeekly publishing in the U.K., it’s the larger groups, not just the ones taken over , which have incurred huge overheads carry huge staff numbers, multi layer of management and are entrenched in old methods that are in the downward spiral of low copy sales against hog overheads. Looking at this sorry tale of woe Archie, I would think many papers would be quite relieved to only have a 10 per cent drop in circulation. In particular my former paper, the Birmingham Mail, has lost another 21 per cent and now averages just 19,200! A very sorry state of affairs indeed. Some small free papers with a handful of staff are wiping sales off rival paid fors. They simply know their market better. When I read comments like suebrown’s I just groan with despair. It’s just like stick your fingers in your ears and shouting ‘la la la, there’s nothing wrong with print!’. Of course there is! Yes, print still makes money for traditional publishers and, yes, the lion’s share of it too but compare the actual figures from 10 years ago. It’s fallen off a cliff! Now, look at digital revenue. It makes money, albeit a much smaller percentage than that of print but compare those figures from 10 years ago. Massive increase! So, as an investor, which would you put your money into over the next decade? Judging by the figures above, a large number of these titles will be unsustainable in print within five years and it’s unlikely that even the largest ones will be selling 20,000 copies. This is NOTHING to do with lack of investment in print. It’s simply to do with a changing marketplace and competition, especially from all manner of digital niches. The ad blocking ‘issue’ is usually trotted out by die-hard print journalists pushing doom and gloom about digital. Ad blockers are commercial entities so why are most applications free? This is because they all have ‘whitelists’. In fact, one of the largest, Adblock Plus, has its own ‘acceptable ads’ platform. What they’ll do is take additional information from their users then only serve them adverts which are most relevant to them. Digital publishers will just end up pricing their CPM, CPC and CPA inventory differently to use this additional targeted user information to their advantage. Readers get fewer irrelevant ads, advertisers get a better ROI and publishers make more money. Everyone’s a winner! Digital is not a mess. It’s evolving at great speed and new opportunities come and go every day. You can’t say that about print! It seems that whenever anyone talks about digital income making a “massive increase” we never see the cash figures. So we are left to assume (rightly or wrongly) that hard copy is still making more cash even though it is on the slide. Massive percentages do not equate to huge amounts of money. A quid raised to £1.50 is a massive 50 per cent rise. But it still ain’t a lot of money. Without doubt regional print as you say , however much one denies it,dress it up or cut it , is dead,and majority of the titles listed above will be gone unless the publishers falsely prop them up, I think it will also be much less than 5 years. I just don’t believe print media publishers and the commercial staff ( the ones I speak to anyway including managers) have grasped the medium, they were set up, tooled up, staffed up and trained in ‘newsprint’ , digital online is like chalk and cheese but they are stuck with a print medium infrastructure so are just shuffling the furniture and using what they’ve got but not making any progress. Most will stagger along until the money runs out which if it relies on dwindling print revenues and minuscule digital money won’t be too long. Paperboy, you’re absolutely right. We need actual figures, so let’s take yesterday’s article about Trinity Mirror’s profits. Okay, revenue and profit are two very different things but lets look at the figures stated. Print publishing revenues up from £485.9m to £581m and digital revenues up from £42.9m to £79m. That’s a 19 per cent increase and 84 per cent increase, respectively. Now if that trend were to continue at the same pace (and, yes, that’s a big if) the actual figures for digital would be generating greater revenue than print by mid-2021. Now, my guess would be that the growth of print revenues will slow, mainly due the state of newspaper sales as highlighted above, so where digital could be the main ‘bread-winner’ within four years! Norridge makes good points about the lacking investment in editorial when it comes to digital but, at regional levels, I don’t think digital advertising will ever reach the heady highs of print. There are far too many competitors in that arena. The regionals will continually consolidate titles to save costs and, as a result, small independents will fill those gaps. I hope that one day, what we’ll end up with is completely different low-profit local business models away from the hands of the regional publishers… but it’ll still all be about digital!